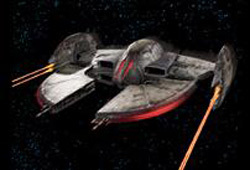 The Trade Federation droid bomber, or advanced droid bomber, was a droid starfighter of Xi Char design used by the Trade Federation and later the Confederacy of Independent Systems. The Trade Federation droid bomber was armed with four laser cannons and a high capacity bomb bay. Although well armored and shielded, it was slow and lacked maneuverability. In most cases, the bomber was deployed in squadrons of five. While the Vulture droid starfighter had maneuverability and speed, the bomber was easy to hit due to the predictability of their flight path. Like the starfighter version, the droid bomber was similarly slaved to a Lucrehulk-class Droid Control Ship. This bomber was used against the pirate Nym on Lok. During the Invasion of Naboo, the Trade Federation employed advanced droid bombers against the Naboo resistance forces. The bombers saw further use in other places of Federation activity, such as the Karthakk system. They were later used by the Confederacy of Independent Systems during the Clone Wars, during the Battle of Viidaav.